Our very own Jazz Jamaica leader Gary Crosby leads a band of young musicians celebrating the Windrush generation with Alexander D Great and friends. Energetic swing, lilting mento, and melodic jazz are flavoured with the spices of the Caribbean and served up by this group of young musicians. Come and celebrate an era where Zoot suits and full skirts were the height of fashion, and jiving and jitterbug dominated the dance halls. 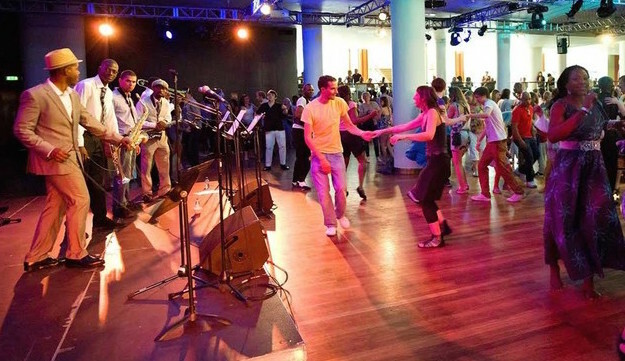 Hear some swing dance tunes, delight in the wit of Calypsonian Grandmaster Lord Kitchener’s lyrics, shake a leg and drop some moves at this week’s Friday Tonic. With the much-loved and hugely charismatic calypso artist Alexander D Great as special guest, this band is guaranteed to bring a sunny start to a winter weekend. Raid your grandparents’ or parents’ wardrobes – or pop along to your local vintage store. Get into the post-war baby boom spirit, dress to impress but most of all bring a fun frame of mind… to boogie. This is another one of our £FREE gigs – but make sure you come early as there’ll be dancing room only.